The antique store is an exciting notion for bargain hunters and lovers of past relics. And in Michigan, a real treasure can be waiting for you. From a great piece of Boomer-era kitsch, to surprisingly valuable gems that take some digging to find, Michigan’s antique stores won’t leave you walking away empty-handed! Here are the 10 best in the state. A Zurko Promotions show in Centreville, the Antique and Vintage Flea Market runs just a few times a year, usually the first Sunday of a month, though often not in July as it conflicts with the fourth. It gets a nod on this list for its sheer mass, however, as it takes up a large portion of an entire fairground. 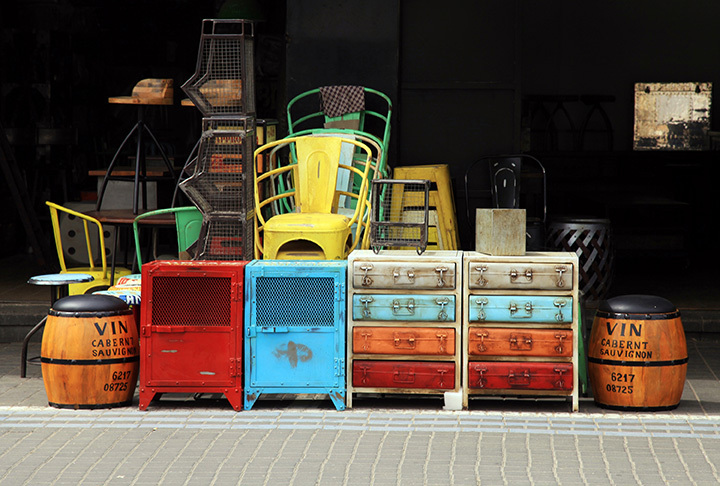 Featuring most everything from books to furniture, the Antique and Vintage Flea Market will not only give you great antiques to choose from, but also enough exercise to cover much of a weekend. Allen, Michigan, is sometimes called the “Antique Capital of the World,” and given how many antique stores there are in Allen, that's not a surprise. Hog Creek Antique Mall, however, may be one of the greats among greats. Voted the best in the area by Hillsdale Daily News study, and holder of a five-star rating from the Treasures of Michigan series, Hog Creek Antique Mall is home to 23,000 square-feet of antiques to browse. Yes, there are antiques in the Upper Peninsula, and one of the biggest names in Upper Peninsula antiques has to be the Main Street Antique Mall in Ishpeming. Headquartered in an antique in its own right—the former Gately's Department Store—Main Street Antique Mall boasts over 8,000 square-feet of antiques, found on three floors and offered by over 40 separate dealers. Check out everything from porch and garden to camp and cottage material with a full selection of jewelry to round it out. Bay Antiques Center in Bay City comes with one great point in its favor. While it's got its slate of accolades, including a No. 1 ranking from no less than AAA of Michigan, it's also got plenty of the kinds of antiques people will make a long trip for. Vintage bottles, vintage advertising, and many more exciting possibilities await. Just to cap it off, it's also said to be the largest such source in Bay City, an achievement by most any standard. Get a taste for Michigan's small town life with a stop at the Vintage Mercantile in Walloon Lake. Not far from Petoskey, this little shop offers a wide array of antiques to check out ranging from home furnishings to clothing. Not a particularly impressive note on its own, but given that the shop itself is located inside a lake cottage that's over 100 years-old, that means the shop not only has antiques but is one itself. Not surprisingly, Detroit features one of Michigan's biggest collections of antiques around, and why not? All the major families and businesses that have settled there over the decades make for a clear concentration of vintage stuff and high-end antiques. Meanwhile, in Ferndale, Rust Belt Market shows off an entire conglomeration of antiques venues. Open mainly weekends and with an attached bar, Rust Belt Market will deliver an impressive array of options for those looking for most anything in antiques. Back with a vengeance, this Grand Rapids landmark—formerly known as Antiques at Victoria's—known as Warehouse One Antiques is under new management and ready to deliver antiques in a big way. With 100 dealers and 25,000 square-feet to its name, this recently-renovated structure will offer plenty of antiques for shoppers to browse. Those interested in selling, meanwhile, will likewise find a warm welcome here as there are some special incentives afoot for those who want to become vendors in this massive space. Days of Yore in Saint Joseph has many of the standard features that one would expect an antique store to have, but it's also got a little something extra. Retro chic items, costume jewelry, glassware, posters...all par for the course here. An online presence on both Ruby Lane and eBay helps improve things, but the real winner is the weight of this place's endorsements. It's been voted the best antique shop in southwest lower Michigan for over 12 years now, and when you've got that kind of ongoing kudos afoot, it's a point that's certainly in this place's favor. Giving Detroit a second mention is really only fair thanks to the sheer amount of antique shops around, especially since this is the one that's in Detroit proper instead of a suburb. The Detroit Antique Mall features 12,000 square-feet of operations, including just about everything from primitives to 20th century items along with an array of antique door styles. Those looking for a little something different to see in Detroit should find just what they're looking for right here. Head for Michigan's capital, Lansing, for a wholly unique experience in a wholly unique venue. It's the largest antique mall in the entire state, boasting over 400 different booths in a space measuring 40,000 square-feet total. It's all in one building, it's all on one floor, and it's been around for over 20 years, an achievement to rank right up with the best in Michigan. The best part is that the prices here are often so good, it's frequented by other dealers looking to catch a potentially profitable piece of new inventory, which means your chances of a good deal shoot up to match.